Stained Glass Star Lamp "Green"
Click the button below to add the Stained Glass Star Lamp "Green" to your wish list. A green stain glass lamp in a shape of a star will add Southern warmth to the living space. Lamp #GS991016 is made of metal frame and handmade glass. This lighting fixture can be used in both modern and traditional decor areas of illuminating house foyer, outdoor patios and gardens. Some buyers during the summer days have been hanging glass star lamps on the back yard trees. It takes about four weeks to deliver lamps from Mexico to the US address. Buy this green glass star lamp in three different sizes. The choices include small, medium and a large lamp. Small stars are occasionally used as a gift. 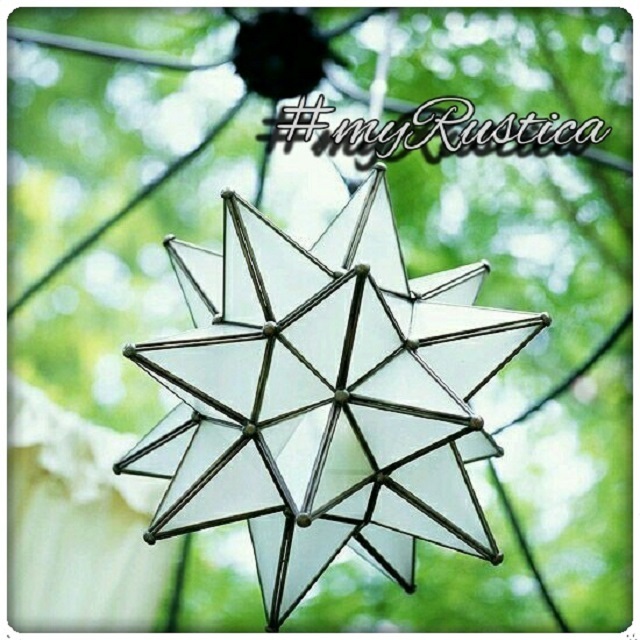 If you need the stars in made to order dimensions send en e-mail message to Rustica House. Price of a custom star lamp depends on the dimensions. The offer is for the lamp sku1016 only, you will need to furnish it with a light bulb and any electric fixture need to connect it to the electricity. Wiring and the socket are included. The product page images shows the same color lamp shade with the light lit and turned off.